Hi, beauty, here we will present you a lot of convenient and trendy hair tutorial. The DIT post provides you Step-by-Step for the Best Cute Hairstyles. Lengthy voluminous bouncy hair is always considered as symbols of sexiness, charm and mature femininity. The lustrous healthy long bouncy hair can always steal the show and is a true eye-catcher. If you also to attract people’s head turns, you can check the following suggestions for the lovely hairstyles. Let’s have a look at how to style a simple yet fascinating low bun. First, comb the hair smooth. Backcomb, tease or curl the topper hair if you desire to make your head voluminous. Then, style the hair into a low ponytail. Next, twist the hair around the pony. Use some pins if needed. If you do not want to curl your hair with curler, here is another cool and cost-saving way: by rage rolling. Before doing it, some rages are needed. It is simple to create. Roll you hair section by section and tie it with rages. For smaller curls, you can roll it tightly. For bigger curls , you can roll it loosely. Release the rages after a long period. If you want to save time, you can roll it before going to bed, and release it the second morning. To keep the curls in place long, apply some hairspray. 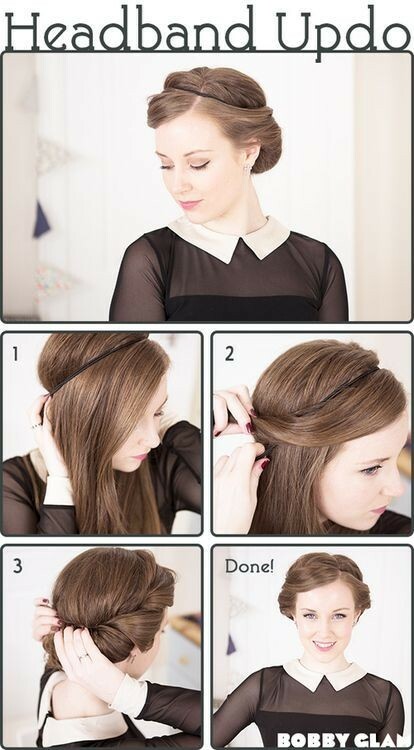 Let’s have a look at the steps of styling a lovely and fun hair bow. First, divide your hair three parts, just as the pictures show. Tie the two locks from side together.Warp it inward. Tuck the rolled hair under the bow shaped hair.Tuck the hair ends under the bow and use bobby pins if needed. Leave the rest hair loose . Retro bouffant returns to fashion and is loved by wide variety of people. Here are the steps. Comb out the front hair and roll it inward. Use some hair gel to keep it in better shape. Fix it with hair bins. As for the rest hair, you can style it at your will. Hanging chains headband is quite trendy and it appears glamorous. To style it, a plastic zig zag stretchy headband some cute chains are needed. Put the chains down the middle, tapering up round the sides. Use the other loose chain links or jump rings as small chains. Attach one chain to every section of the plastic headband. Control the height according to your likeness and your hair. This is a fun and adorable braid. You can do by the following steps. Pull hair form the topper section and begin braiding. with going on, add more locks and control the tightness according to you likes. Tie the hair ends with a hair band. The French roll is often created for formal occasions, it always offers people a charming and seductive effect. Here are the steps. Take your hair form one side to the other side. Roll the hair ends round your right hand and fix it with pins. Tuck the rest ends into the base of the roll. Then, use some pins if needed. Head band with updo can be simply created with several steps. Put a suitable thin rope at the top of head as a headband. Tuck the hair under the rope section by section. Use some pins if needed. This is a gorgeous up-style with a cute oblique braid. The steps are as follows: divide a part of hair from the right or left front. And braid it and tie the hair ends with a clear elastic band. 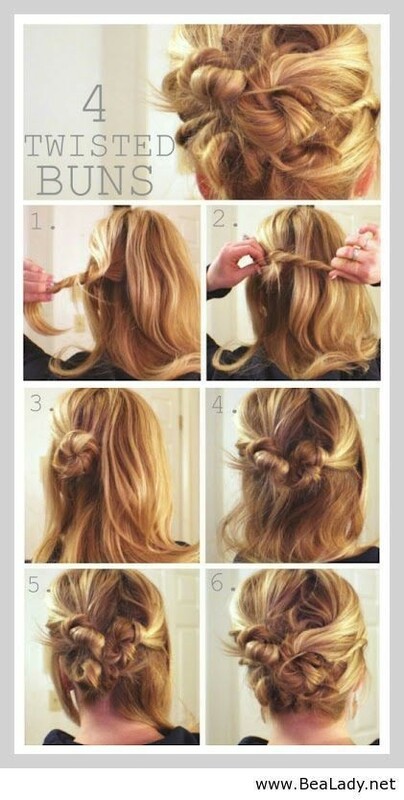 Comb the remaining hair together and put it into a donuts-shaped hair band. Backcomb the hair ends and tuck it into the hair band. Use some pins if needed. This picture shows an attractive and daisy braided u-do. 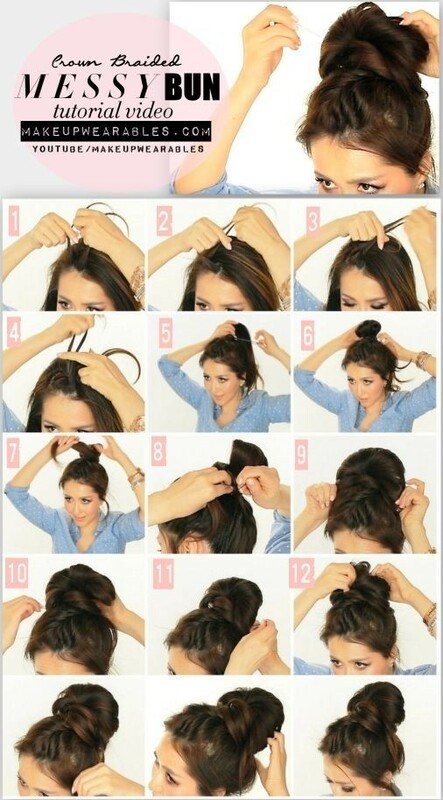 Comb the hair into a low ponytail and tie it with a hair band. Braid the ponytail and tie the hair ends with another hair band. Scoop a hole above the topper hair band and tuck the braided hair in.Use some pins if needed.